Product prices and availability are accurate as of 2019-04-22 11:17:34 UTC and are subject to change. Any price and availability information displayed on http://www.amazon.com/ at the time of purchase will apply to the purchase of this product. Adjustable USMC tactical vest with 2 triple mag pouches, 3 utility pockets and universal holster. 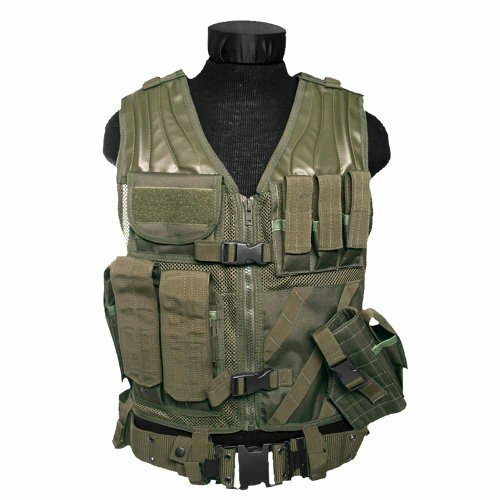 The vest is made of durable polyester mesh which provides perfect ventilation while tough side adjustment straps allow vest to closely contour to the body. Moreover the vest can be adjusted in size over shoulders. The vest opens centrally with a sturdy zipper and buckles. The rear panel of the vest is fitted with sturdy horizontal strap loops which allow for attachment of various pouches and accessories. The upper back comes with a robust drag handle. The vest is destined to carry regular rifle ammo, pistol and extra pistol ammunition. There are 3 ammo pouches with Velcro lids and drainage holes on the right side of the vest destined to carry M4/M16 magazines. Each pouch is adjustable in height and width and comes with 40mm wide elastics around the body of the pouch to retain the magazines. On the left side of the vest there is universal pistol holster for short weapons such as Beretta, Glock, Walther P99, etc. The holster is mounted on the front, angled for easy access and draw by the right hand. Moreover it is fully adjustable and removable and has its own small mag pouch. Additionally the left chest is fitted with an extra three CQB type pistol magazine pockets, each with its own Velcro lid. On the right chest there is a large horizontal pouch for storage of general utilities. There are also 2 inner mesh pockets with zipper and 2 D-rings provided over the shoulders for attachment of additional equipment. The rear mesh back has an internal pocket for insertion of a hydration bladder which is not included. The vest comes with tactical belt mounted though a number of belt loops at the bottom.